Anyone else notice the ARMLESS AVATAR BEHIND HIM??? You're gonna need to be a little more specific than that, please. 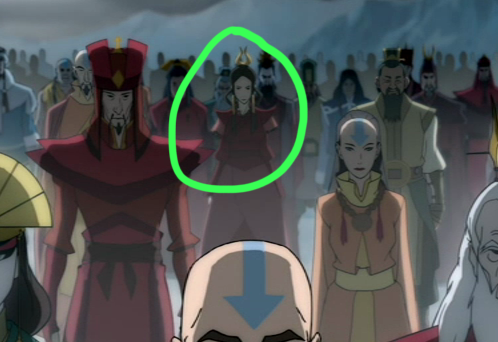 Armless Avatar is where and behind who? Looks like someone forgot to draw them. I heard somewhere, I forgot where, that it was an animation error. Nevertheless, it would still make a great fanon. I can confirm that - the Book One art book shows the storyboard for that scene clearly shows she is supposed to have arms. Her statue at the Southern Air Temple likewise has arms, which I can also confirm from the Book Two art book. So it looks like her lacking arms in that particular scene is just an animation error. Oh, that makes sense, haha. I still prefer the idea of a badass armless woman doing the avatar job. True, it would be highly interesting to see an Avatar with no arms. Though there'd be the same question that many've had - myself included - about Ming-Hua, and how exactly they would bend without arms. I know that's been extensively discussed elsewhere, so I won't spend too much time on it here. Hey All, Suggest me some good avatars I am looking for some new profile picture for my iMessage application which I downloaded from this link - https://imessagepcapp.com/ but this hasn't provided me with avatar.